Meet us at the 14th Lyoscopedia freeze-drying seminar, which will take place on 13th of March 2019 in the Congress Center Würzburg. Such an opportunity to exchange current news from the world of lyophilization is absolutely impossible to miss. 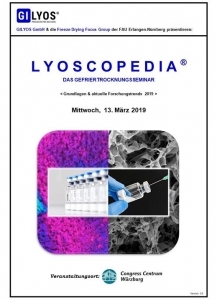 Lyoscopedia 2019 is a seminar not only for freeze-drying experts, but also for newcomers. Diverse scientific programme – from academic research to industrial application – also offers room for exciting discussions on the subject of freeze drying. We look forward to meeting you there. More information on the official website – Lyoscopedia 2019.